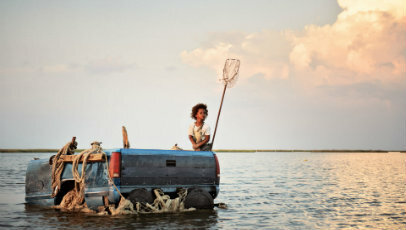 Hushpuppy (Quvenzhané Wallis), a courageous and untamed six-year-old explorer, lives with her father, Wink (Dwight Henry), in a remote community known as the Bathtub. Living in a detached, yet idyllic society, Hushpuppy has, like the other dwellers, been forced to mature quickly and become entirely self-sufficient, spending her days finding food to keep herself alive. Their stark way of life is tested, however, when a fatal storm rears its ugly head, bringing about the threat of ultimate destruction. Bursting with vivid artistry and child-like charm, Beasts Of The Southern Wild reveals the disasters of the world exclusively through Hushpuppy’s perspective. From the disinterested and habitual way she lights the stove with a flamethrower to her fearless and freewheeling, yet remarkably innocent nature, it’s made clear from the offset that Hushpuppy is a child whose life is deeply rooted in the very fabric of nature and whose been forced to mature quickly only to ensure she has the very best chance in life. The script, co-written by Benh Zeitlin (who also makes his directorial debut) and Lucy Alibar, thankfully never dwells on the day-to-day hardships Hushpuppy and those of the Bathtub have to face, but also never downplays them either. It’s perhaps because Benh and Alibar demonstrate those difficulties as the norm that enables Beasts Of The Southern Wild to be so accessible and believable – a way of life that’s both difficult to endure, yet rewarding in its simplicity and nonmaterialistic disposition. It’s an approach that makes the film immediately beguiling. Almost otherworldly in its visuals, capped off with powerful uses of allegories to represent the impending storm (a herd of aurochs being the most successful in their dominating scale and sheer ferocity), Behn displays a skill way beyond his maturity and aptitude. He handles the material with such care and attention-to-detail that makes the film such a treat to enjoy and devour from the very first frame to the very last. His control may waver somewhat towards the halfway point, but its cleverly obscured by the films other elements, such as Zeitlin and Dan Romer’s enchanting score, the unbounded and unearthly colour palette sheathed by cinematographer Ben Richardson and Wallis’ revelatory, poetic and laudable central performance (Henry, too, is deserving of special felicitation). He redeems himself come the end though, with a final scene fraught with such stirring and radiant passion that will leave you beaming from ear to ear. Beasts Of The Southern Wild is, without a shadow of a doubt, one of the most original, absorbing and lyrical pieces of filmmaking in some years. It’s difficult to comprehend how an accumulation of such talented, yet inexperienced and novice individuals (Wallis is a total newcomer, while Henry was previously a baker who survived Hurricane Katrina firsthand) could piece together something as magical as what’s on display here. An unquestionable treasure, and perhaps the less distracting use of shaky cam to exist, ever.